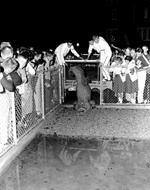 University of Florida mascot Albert being put into pen with cheerleaders and students watching. Albert being put into pen with cheerleaders and students watching. Photograph 4589 from the University Archives Photograph Collection.